Blain's Farm & Fleet has the DWMT75049 DeWalt 192 Pc. 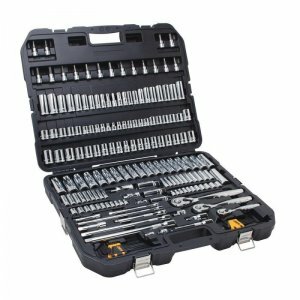 Mechanic's Tool Set on sale for $149. The regular price for this set is $199, though it is typically sold for $209 on Amazon. This set seems to be well received with a rating of 4.7 out of 5 stars on Amazon. It features a 72 Tooth gear system that offers high torque ratcheting. In addition, the deep laser etched markings make it easy to identify different socket sizes. There is a 5-degree arc swing and slim head design equipped in this DEWALT Mechanics Tools Set that allows easy maneuverability in cramped areas.